Want to be notified of new releases in SSilence/sum? 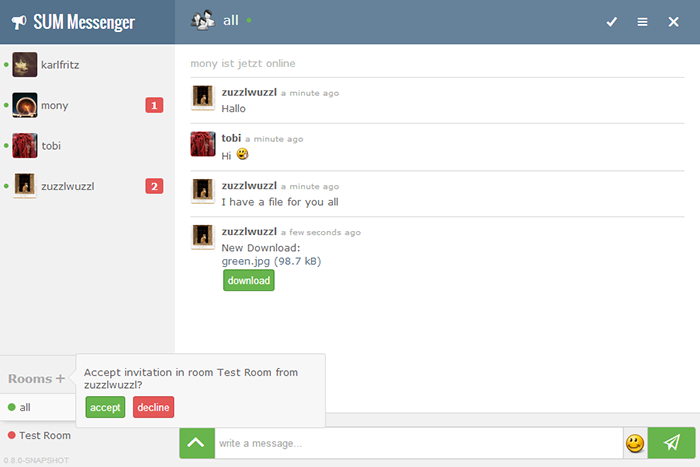 SUM is a simple secure desktop instant messenger for local networks. No server infrastructure is needed. User find each other by registering in a file which will be stored at a shared network folder or optionally by an simple backend written in php. The communication between users is RSA encrypted. User can verify the identity of the other users by sharing their public keys. SUM is ideal for communication in company's because no messages will be stored anywhere. The integrated public/private key management allows a encrypted communication and ensures a tap-proof and tamper-proof messaging. Download and unzip sum.zip. You can start sum by executing sum.exe. You can configure SUM by adding config.ini in the same folder as your sum.exe. You can also enter the path of the config.ini as command line argument for sum.exe. Before you can use SUM you have to configure first how your chat clients will find each other. You can choose between using a network drive (shared directory) or using a php based backend script on a webserver. You can also use the backend.php on your webserver. This little script saves the userlist in a sqlite database (you don't have to configure anything, just give the script write permissions to the folder backend.php is in). Before the SUM client saves the data in the backend.php script it encrypts it. You can specify the AES password. Only your clients can decrypt the data stored on the webserver. The AES key will be used for encrypting all user informations before putting them on your share or server. This ensures that no internal information (like IP addresses or usernames) will be accessible outside your closed network. You can configure following values in your config.ini. See default.ini for default settings. See developer guide for more information about SUMs architecture, how you install the development environment, test, build and debug SUM. Feel free to send a pull request. Thanks a lot to Andi for implementing code message type.